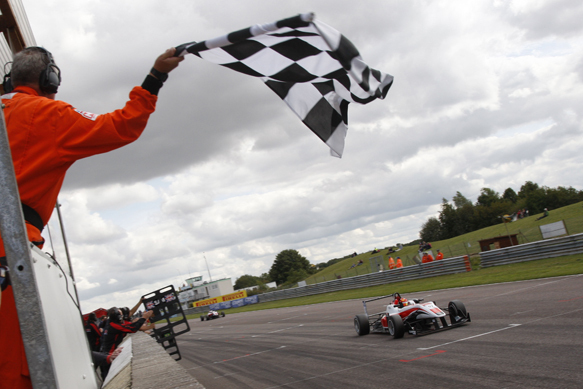 Martin Cao finally scored his first British Formula 3 Championship win at Thruxton to move back into the series lead after a race-long battle with Matt Rao. Poleman Rao had trouble getting the car out of first gear off the line, having to dip the clutch and conceding the lead to Fortec Motorsport team-mate Cao. The five-car field had already become four. Max Marshall had stalled on the green-flag lap, before erroneously retaking his third grid position - but not before spinning at the chicane as he tried to warm up his tyres. Marshall stalled again at the start and Double R Racing team-mate Camren Kaminsky wiped his right rear suspension out against the stricken car. The safety car emerged, allowing Marshall, who had pitted for a new left rear tyre, to catch up the field again. Cao suffered overheated tyres and brakes after the safety car and Rao was able to make a sweet move down the inside of the chicane four laps into the restart. Cao took a few laps to catch up again and on the 15th lap of 24 he slipstreamed Rao on the run to the chicane. As he cut across to claim the inside line, he knocked the front wing of Rao's sister Dallara-Mercedes askew. With lairy handling in the high-speed stuff, Rao did a good job to cut the gap back to Cao to finish just over one second adrift at the flag. In third place, Peter Li looked briefly as though he might get on terms with the leading duo in his Carlin Dallara-Volkswagen, but he eventually fell away in third. Li was untroubled by Marshall, who has taken pole position for Sunday's reversed-grid race.